There are many things I can say about the last ten weeks I’ve spent in Marion. I learned a lot about Marion, the rural South, the Black Belt, and myself. I also learned a grand life lesson: Nothing ever works out as planned. I came into Marion thinking that I would change it, in some way, for the better. I was going to bring the community together. I was going to educate the youth. I was going to do things to help Marion. What I didn’t expect was that Marion would change and help me. None of what I had planned ever came to fruition. The documentary, the festival, the mock trial and chess teams, or anything else I had envisioned when I was in a classroom at Auburn University. But none of it had to because that’s not what Marion wanted or needed this summer. And it wasn’t what I needed either. I could list and state all of the things that I did end up accomplishing this summer, but instead of touting my success, I want to praise and thank Marion for their utter successes. First, I would like to thank Katrina Easley, my community partner and county extension coordinator for Perry County’s branch of the Alabama Cooperative Extension System. Without her, I would not have had the contacts I needed to do or attempt to do any of my projects. Nor would I have been able to get around town. 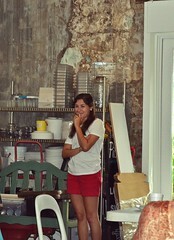 Katrina was an invaluable asset, and I am so grateful I had her as I was working my way through Marion. As I’m thanking Katrina, I would also like to thank Melanie Hogue, the administrative support associate, who helped me get into contact with Katrina, took down countless messages, and answered any inquiries I had. Second, I would like to thank Judson College for allowing me to stay at Elmcrest, the oldest building on campus, and for being so helpful when I had any questions. Even if the question was as simple as, “Where’s the dumpster?” the staff at Judson was always more than happy to answer. The campus was beautiful, and the food in the dining hall was fantastic. Third, I would like to thank the Marion Presbyterian “Women in the Community” Book Club for welcoming me with open arms. The ladies in that group were some of my first contacts in Marion and the first I made on my own. Thank you for being there with me, ladies. I hope you have lots of good books to read in the future. 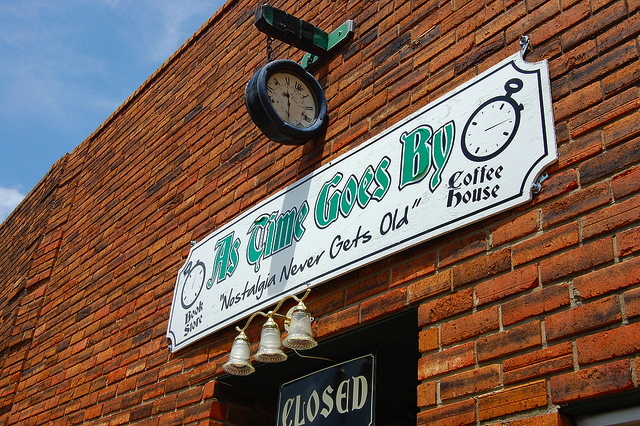 Fourth, I’d like to thank Mr. Charles Flaherty, owner of As Time Goes By, for always sharing his cool stories and for running a really nice bookstore that I will miss. I probably bought at least 30 books when I was in Marion and I think I spent maybe $15 on them all. There are so many more people I need to thank and absolutely no way I’ll remember them all. In no particular order, here are some more of the spectacular people I met on my journey in the Black Belt. Thank you to Zion United Methodist Church and Mrs. Childs in particular. Thank you for welcoming me at that first service and for allowing my family and me to volunteer at your Vacation Bible School. We had a blast. Thank you, Marion Presbyterian, for also allowing me to partake in a service and to the generous person who bought my mom’s and my lunch at Kalico Kitchen following the service. Thank you to Frances Ford and everyone at Sowing Seeds of Hope. Thank you for helping out whenever I needed it. Thank you to Carli Ludlow and Chelbie Greenhaw for being there to drive me around and bounce ideas off of. The sports camp, although short-lived, was an experience. Mr. Don Coley, thank you for sharing your wonderful folk are with me. I hope you get better soon. Thank you to the Marion-Perry County Library and Searria Easley for helping me with the book giveaway. Thank you to Jean Dean Reading Is Fundamental in Auburn for donating books. Thanks again to Sowing Seeds of Hope for the Frisbees. Thanks to Golden Flake for donating the bags of chips. And a big thank you to everyone who came. Thanks to both Southland and Perry County nursing homes. 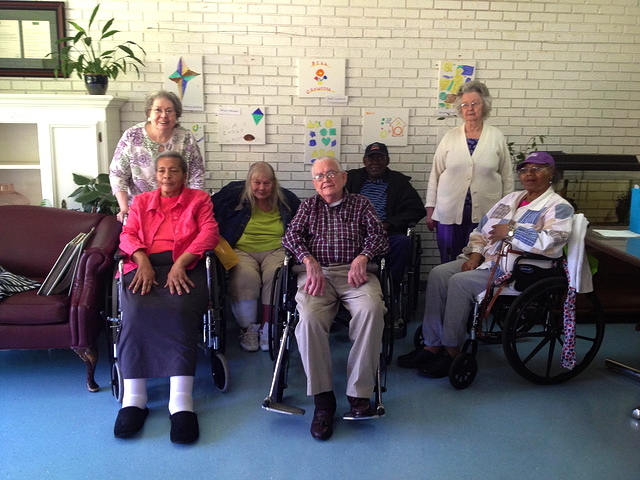 Spending time with the residents was really a lot of fun. Seeing their artwork on display was such a joy, but seeing how happy they were was just amazing. And I’ll definitely visit in the future. Finally, thank you to my mom and my family for helping me in this endeavor. I couldn’t do it without you. Thank you so much. Marion, Ala., was a town I knew almost nothing about a year ago. I learned a little in the months leading up to the start of my Living Democracy Fellowship, but I learned the most when I was in the town. Thank you. Like Carrie Underwood sings, “I will see you again. This is not where it ends.” So, Marion, until next time. Nature is a majestic sight to behold. Painters, poets, and photographers have all tried to capture the beauty of nature throughout history. What is it? Why is it so gorgeous? The Grand Canyon, Mount Everest, and other natural wonders are all revered sights to be looked at and praised. In today’s world of concrete jungles and smartphones, nature is often a forgotten relic of the past. There is something mysterious about it, and mankind tends to shy away from what it does not understand. Who made it? How did nature come to be? Yet these questions are not pressing issues in Marion. 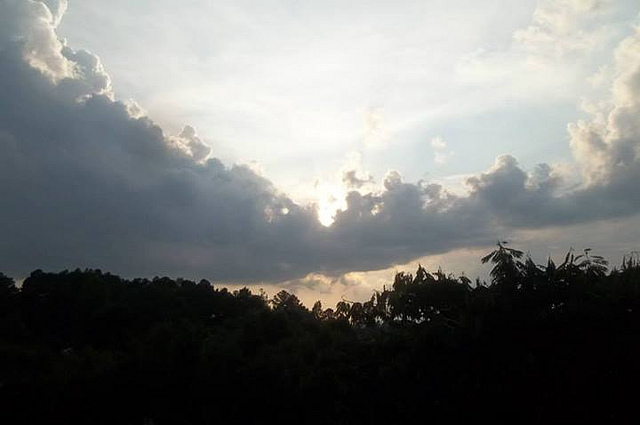 Nature is there to be observed and learned from. It is there, and the citizens of Marion come to appreciate at a very special place. Perry County Lakes Park is the name of that place. 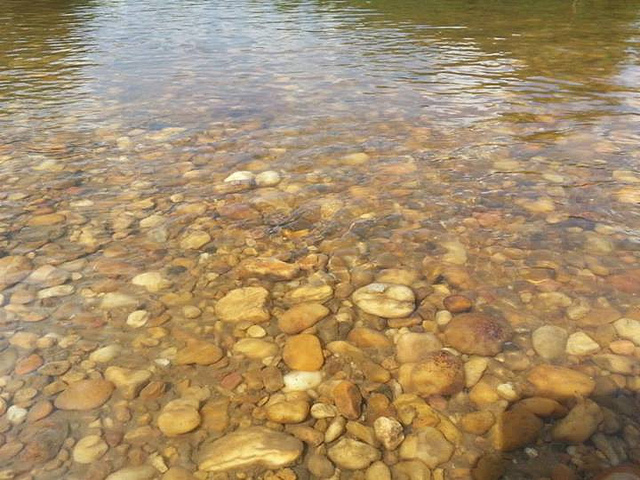 It is located 5 miles east of Marion next to the State Fish Hatchery on State Highway 175. Driving by the hatchery, one could easily miss the nature reserve. But hidden in those woods lies a natural piece of art. PerryLakes.org states: “The Perry Lakes Park and Wildlife Sanctuary contains about 600 acres available to the public for outdoor recreation, education, scientific research, and other activities. Interpretive nature trails (fire lanes and primitive paths) make walking through the woods fairly easy and fun.” With so many acres, visitors are able to discover something new each time they come to explore. A favorite spot for visitors of Perry County Lakes Park is Barton’s Beach. 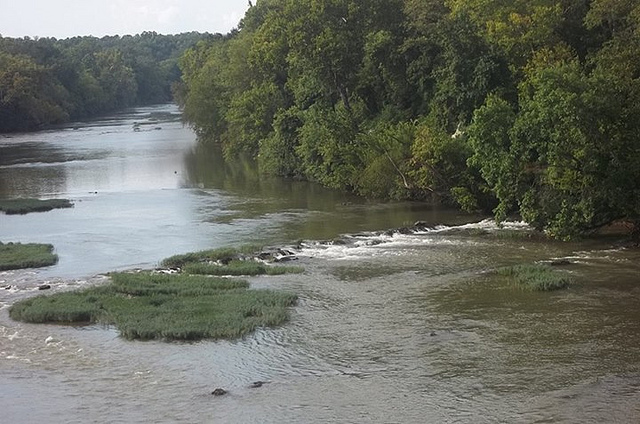 There people are able to swim in the Cahaba River in relative privacy. 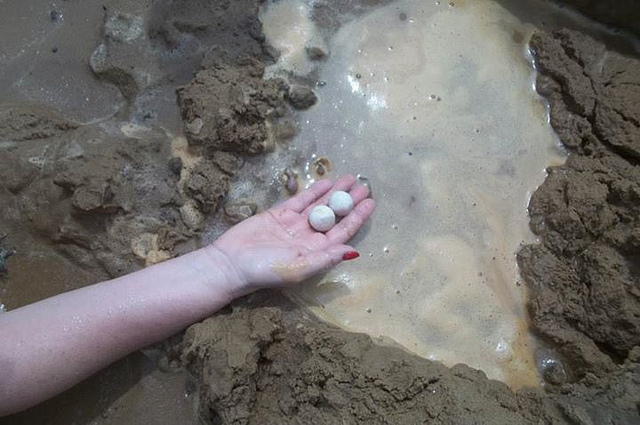 There is even sand at the “beach” so those in the Marion area are able to go to the beach near their hometown. Auburn University also has a special tie to Perry County Lakes Park because the Rural Studio built a birding tower in the park that provides a view of the floodplain forest and the birds in the upper canopy of trees. Every day of the year people can come from all over the country to see the sights at Perry County Lakes Park. They just have to be sure to arrive after sunrise and leave before sundown. The best part about Perry County Lakes Park is that it is free to all visitors. Varied ways to entertain oneself within the park’s limits include hiking, bird watching, swimming or geocaching. All of it is completely free of charge. This YouTube video showcases the absolute beauty of the park: http://www.youtube.com/watch?v=tPFx3BOr6mk. My summer in Marion was often hectic and stressful, so it was nice that I was able to discover such a relaxing and beautiful spot at Perry County Lakes Park where I was able to retreat to from time to time with family and friends. Even though I was busy trying to figure out how to go about my Living Democracy projects, I was able to take a few hours to relax and enjoy myself. I was able to walk through the woods on a well-beaten trail and take in the fresh air. I was able to see the wonder of nature with my own eyes. The magnificence of trees that reach unbelievable heights and a section of the Cahaba River that I had virtually to myself were just some of the amazing things I was able to experience at Perry County Lakes Park. Sometimes, people lose sight of what is important. In the race to the top, we forget the simple things. We are hungry for success, money, fame, and we miss the small moments that can really change us. This past summer that I spent in Marion as part of Living Democracy was probably one of the slowest summers I have ever had. I was busy every day, and I was constantly on the go. But when I reflect on my time, it feels like I was spending every second looking forward to the next. I was anxious to get my projects done. I was nervous about not doing my job the way my supervisors expected me to do. I was ready to start fall semester classes so that I could begin the next chapter of my life and progress through my checklist of things I have to do in order to attain a high profile career. But just because I was trying to be fast about what I wanted to do, Marion wasn’t having any of it. The town is small, with a population numbering close to 4,000 people, give or take a few hundred. These people have lived there for generations. It is an hour from Tuscaloosa and roughly half an hour away from Selma. There is no Wal-Mart or McDonald’s. People in Marion move at a slower pace than people do in bigger towns. As funny as it sounds, I had to slow myself way down in order to catch up to their pace. I was a fish out of water and I didn’t know what to do or how to do it. But the ten weeks I spent in Marion taught me that being the fastest isn’t always a guarantee of victory in a race. And eventually I was able to learn about Marion’s citizens and what they wanted or what they needed instead of trying to implement a project because it was what I knew, was familiar with, and wanted to do. I slowed down, and I was able to win my race. And I learned that slow and steady wins the race when I was walking on the trails of Perry County Lakes Park, trying to reach Barton’s Beach and taking in the nature around me. It was beautiful. All of the trees and flowers were really amazing to see, and I know that they took their time to grow. Every Tuesday at 10 a.m., women from all over Perry County gather at the Lincoln Normal School in Marion to discuss the latest town gossip and their families, to spend time with beloved friends and to quilt beautiful pieces of artwork. Summertime is the time for vacations and relaxation from the business of everyday life. But for this group of women the way to relaxation is through the eye of a needle. The West Perry Arts and Crafts Club, as it is formally known, owes its existence to Mattie Atkins who founded the club seven years ago. The recipient of several grants from the Black Belt Arts Initiative, the club has been able to survive and flourish over the last few years. The atmosphere in the room where the ladies meet Tuesday mornings is relaxed and friendly. This is not a place to be stoic but a place to have fun. The morning is started with a round of hugs. After everyone is greeted properly, a small television is set up at the front of the room, and the “Price is Right” is put on in the background. With three different quilt frames, one small, one large and one electric, there are plenty of spaces for the women to sit and sew. 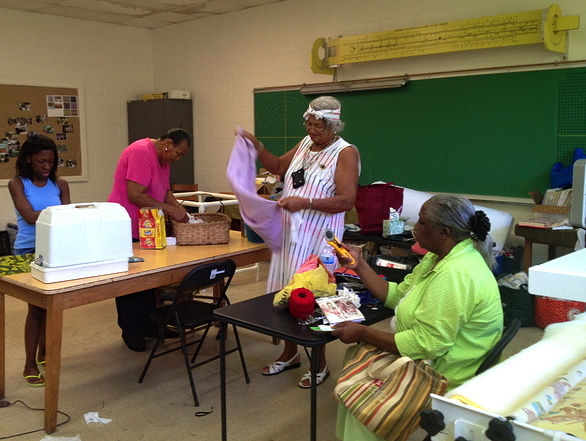 The electric frame has been having some problems, but that did not slow the members of the quilting group from setting themselves up at the other two stations with projects already half finished. Visitors are welcome to come and observe the ladies at work. They are also more than welcome to take a seat and make a stitch or two on one of the many quilting projects laid out. “If you want to learn how to sew, you can make a stitch,” is a repeated phrase heard in the sewing room when visitors are present. This particular Tuesday, there was some exciting news. Someone donated a laptop to the sewing club. But even with this new hi-tech addition, one the ladies in the room were very grateful for, it did not deter the quilters from hand-stitching their quilts. 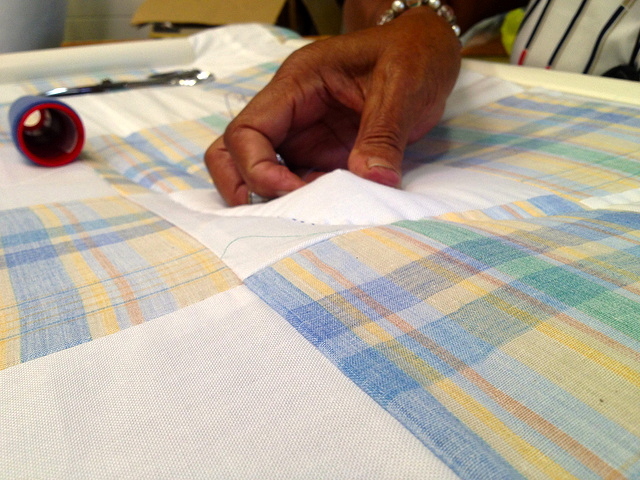 Sewing and quilting are skills passed down from mothers and grandmothers and the ladies of the West Perry-Marion Arts & Crafts Training Center know how important tradition is. 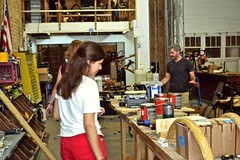 They occasionally host youth from the Marion community to teach them about their craft. This particular day, two young people in attendance were put to work threading needles and learning to stitch. 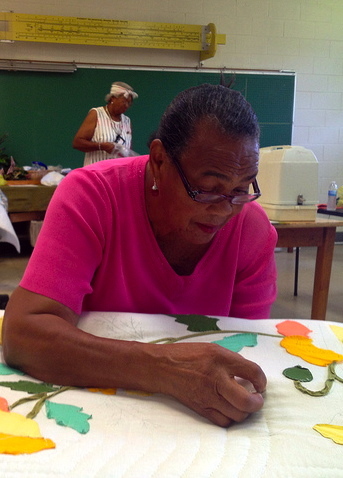 Mattie Atkins reminisced about how her mother first taught her to quilt. 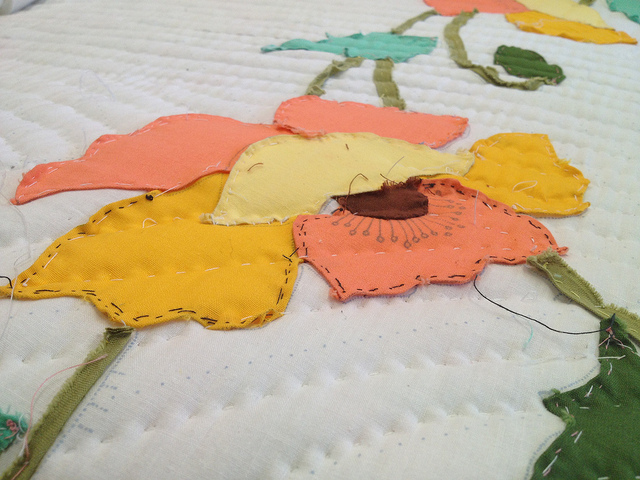 “She would let us make a stitch on the corner of the quilt,” Atkins said. 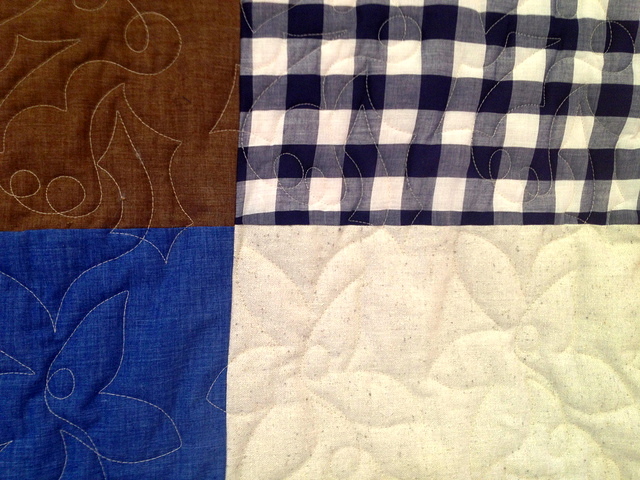 “But not in the middle, no, never in the middle.” Atkins laughed at the memory of learning how to quilt from her mother as she skillfully stitched the part of the quilt she was working on. The room was quiet, but it was the kind of comfortable silence shared by a group of people who are completely at ease with themselves and each other. There was no need for chatter, although occasionally a joke or two was shared or an observation made. Yet there was no urgency for conversation in this group of women who knew each other so well. Phylicia Rashad once stated, “Any time women come together with a collective intention, it’s a powerful thing. Whether it’s sitting down making a quilt, in a kitchen preparing a meal, in a club reading the same book, or around the table playing cards, or planning a birthday party, when women come together with a collective intention, magic happens.” And magic can certainly be found in the room of the Lincoln Normal School where the sewing group meets once a week, on Tuesday mornings. 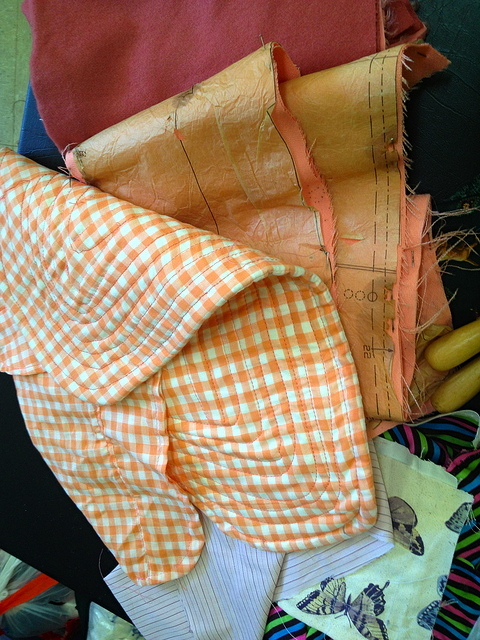 Evidence of the magic can be seen in the beautiful projects they quilt and sew. But the stronger sign of magic is in the love the ladies of the club possess because they love with all their hearts. They love their hometown of Marion. They love to quilt and sew. They love each other. And they love to teach visitors to love the same. 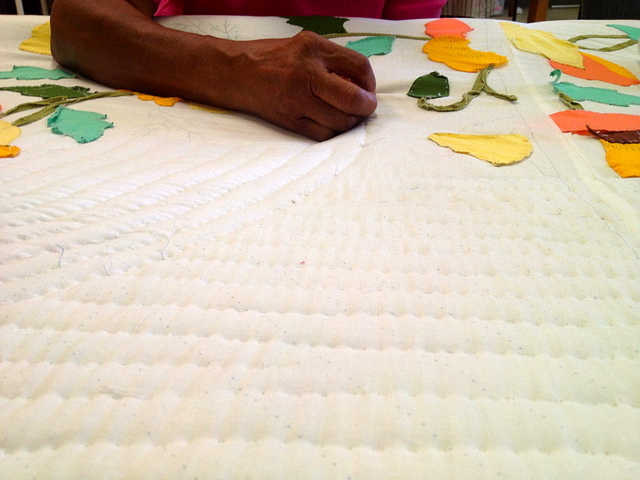 Quilting is an art that takes decades to master, but the ability to love has taken mankind millennia to learn. And one group of women in Marion, Ala., has the exceptional talent of being able to do both with extraordinary skill. 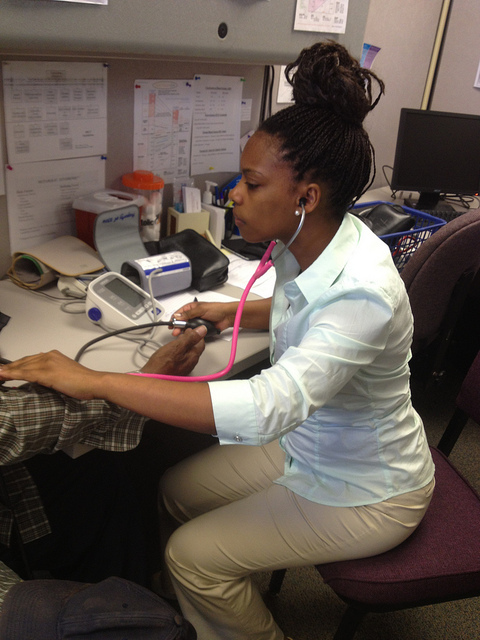 Health care professional checks blood pressure at weekly hypertension clinic in Marion. 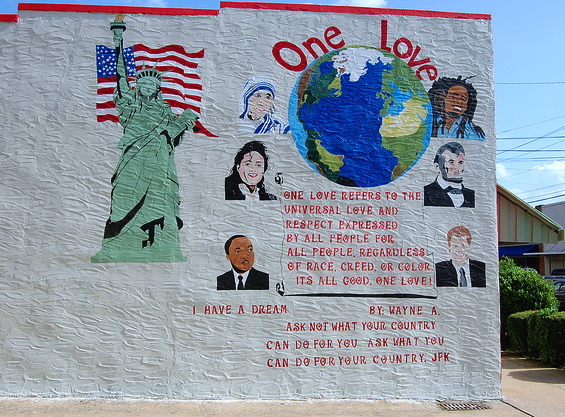 Community is the focus of Auburn University’s College of Liberal Arts’ Living Democracy program. What makes a community? How can a community be either good or bad? How can communities improve? These are just some of the many questions seven Auburn University students have been asking themselves over the last few months. From Collinsville to Selma to Bayou La Batre, these students have learned valuable lessons about how communities work in Alabama. During my time as a Living Democracy Fellow in Marion, I have learned that community is not defined by how many buildings hold thriving businesses on the courthouse square or by the city limits. For Marion, community is the people. The people in the churches, schools and workplaces are all the foundations of community. A few local organizations recognize that Marion needs healthy citizens to have a healthy community. This is where Sowing Seeds of Hope, the Perry County Health Department, and Samford University’s McWhorter School of Pharmacy come in. Samford University, the Perry County Health Department and Sowing Seeds of Hope all possess missions to help. Samford helps its students cultivate their talents by connecting them with professors and faculty who can pass along grains of wisdom gathered from years of experience in a demanding and often challenging world. 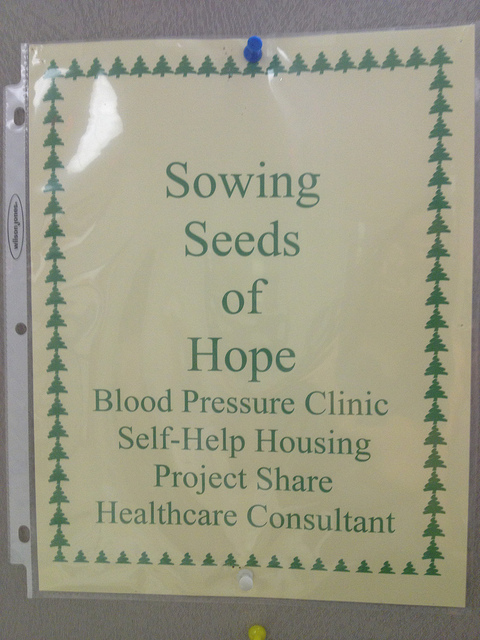 The Perry County Health Department “offers clinical and environmental services to the public.” And Sowing Seeds of Hope provides many services to the community, ranging from housing to healthcare. These three distinct entities unite to help the citizens of Marion and Perry County in a free hypertension clinic offered every Wednesday from 2 to 4 p.m. Dr. Charles Sands of Samford University and Sowing Seeds of Hope’s Executive Director Frances Ford started the cardiovascular risk reduction clinic, which is known locally as the hypertension clinic. However, blood pressure checks are not the only things going on every Wednesday afternoon at the Perry County Health Department. The clinic also checks blood sugar, weight, cholesterol and educates patients on use of medications and a healthy lifestyle. Dr. Pilar Murphy, an assistant professor at Samford University who originally hails from Arkansas, states that she has seen the positive effects the clinic is having in the community. 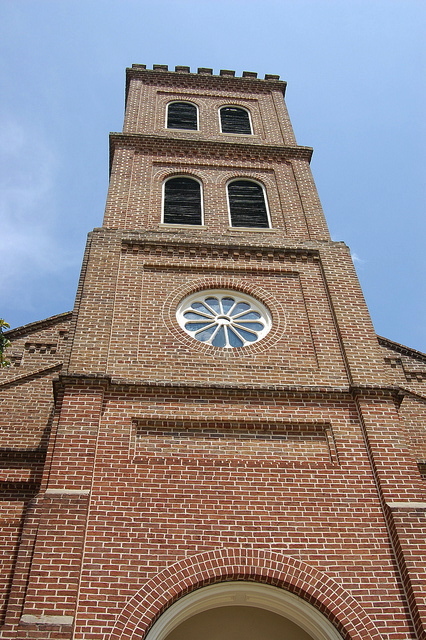 For example, the Friendship Baptist Church now has a partnership with Samford’s McWhorter School of Pharmacy. The pharmacy students come to Marion once a month to host a health fair and a healthy dinner. 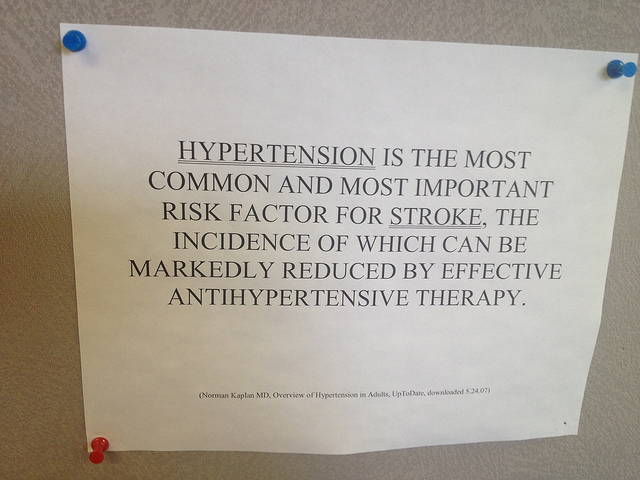 The hypertension clinic is widely publicized so that Marion residents are aware of the free services offered. Along with a newspaper ad that runs every week in The Marion Times Standard, the clinic also contacts various local churches and hosts a radio program called “Body Love” that airs on WJUS 1310 AM and 94.3 FM every Wednesday morning. Each week’s volume of patients varies, which is usual, especially for a small town. This summer, the clinic has averaged about 10 to 12 patients but some days up to 24 people were in the waiting room ready to be seen. Epictetus once said, “It takes more than just a good looking body. 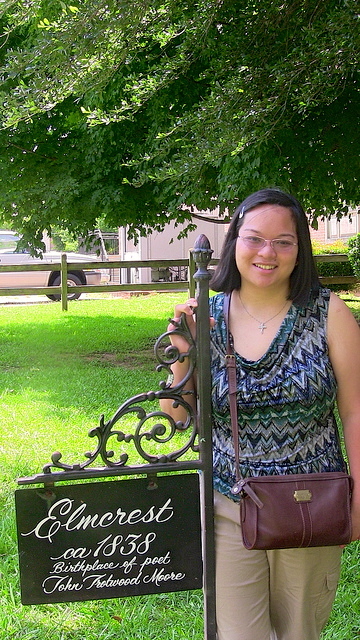 You’ve got to have the heart and soul to go with it.” Maybe Marion doesn’t have the prettiest body in Alabama. But despite every hardship, Marion always gets up and tries again. The Samford students and I, through the Living Democracy experience, are learning that it does have a big heart and bright soul. Every community has a special place it regards as sacred. It doesn’t have to possess a religious affiliation or hundreds of years of history. It can be the local library, the courthouse, a favorite restaurant or a cherished schoolyard. Marion is able to claim ownership to all of these special spaces. There is the much loved Marion-Perry County Library, where people come to visit with friends, participate in arts and crafts days, use the library computers and check out books and movies. 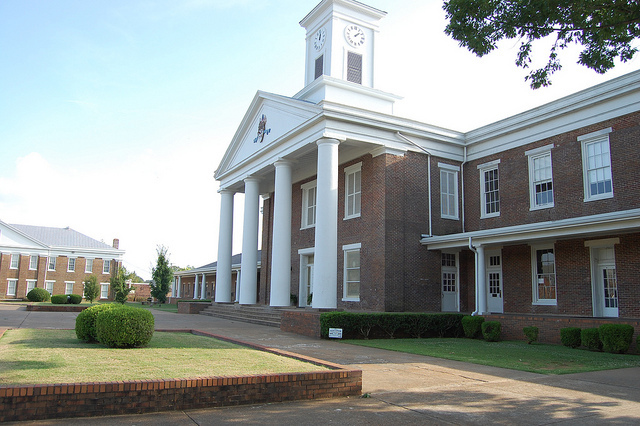 Then there is the historic Perry County Courthouse, where much official business takes place. The Kalico Kitchen is a favorite eatery of the community, especially Sundays after church. And the historic Lincoln Normal School is a cherished piece of history where members of Marion still gather to quilt, to host social functions and to pay respect to the past. People travel near and far to attend these educational facilities. 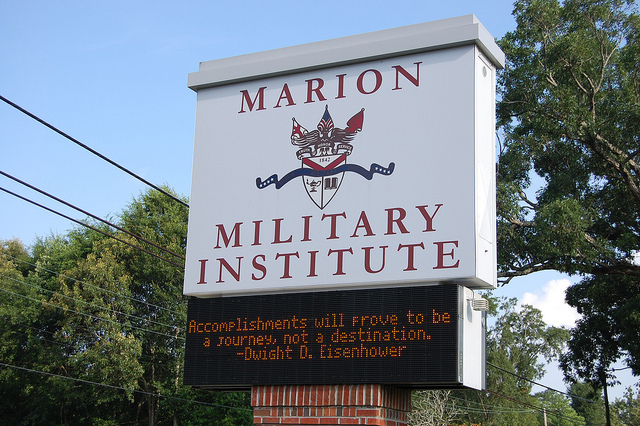 Judson College is one of the few remaining all female colleges in the nation, and Marion Military Institute was ranked #16 in the United States among community colleges, according to TheBestSchools.org. Located virtually across the street from each other, Judson and MMI have a long standing tradition of working together. The two schools have a rich history. With a great working relationship, it is no wonder that Judson College and Marion Military Institute share the title of “sacred space” in Marion. Every fresh-faced individual is automatically asked about any association with either of the two colleges. Each new tourist is pointed in the direction of each historic school. Not only do the two schools possess a great connection within the Marion community, but they each also hold a special honor within the state. 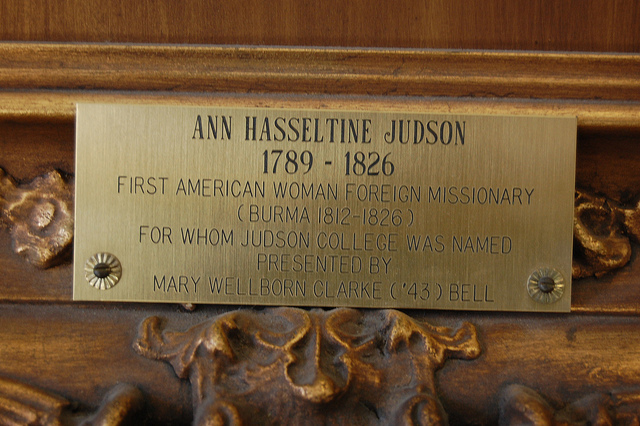 Judson College is the home of the Alabama Women’s Hall of Fame. 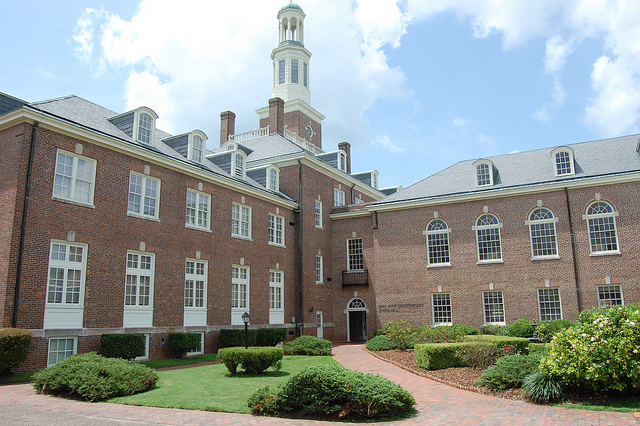 And Marion Military Institute houses the Alabama Military Hall of Honor. Some notable members of the Alabama Women’s Hall of Fame are Helen Keller, Coretta Scott King and Zelda Fitzgerald. And the Alabama Military Hall of Honor continuously honors members of the military. So “Wisdom sits in places” as the Apache proverb noted above, and Judson and MMI certainly fit the bill. Each place possesses hundreds of years’ worth of interesting history. Judson dates its origin to 1838, and MMI claims 1842 as the year of its founding. Both World Wars and the Civil Rights Movement are just some of the major historical events of the United States that both of the colleges witnessed. The colleges hold wisdom that has been gained from each student who journeys through the campuses. Both school libraries are full of books written by the greatest playwrights, philosophers and scientists. But Judson and MMI also owe their wisdom to Marion. Marion is a small, rural community. And while much has changed since the founding of each of these colleges, other things have remained the same. There is still an air of the past that lingers in the town. You can still buy a piece of candy at College City Drugs for 5 cents if you’d like. People still smile and say hello as you walk down the street even if you have never met them before. Aldous Huxley once said, “Experience is not what happens to you; it’s what you do with what happens to you.” A lot has happened in Marion over the years. Most of the residents, however, are not bitter about the bad things that have occurred. Neither are they haughty about the good things. There is something wise about the humility that can be found in Marion. And that wisdom is also demonstrated by Judson College and Marion Military Institute. A quote attributed to the philosopher Socrates is, “The only true wisdom is in knowing you know nothing.” Marion, its citizens, its colleges all know something, but they are all more than happy to step back, observe and learn.